It’s no secret that I am a big believer in First Looks. They are just as powerful (if not more so, in my opinion) as the walk down the aisle. They are the couple’s own private moment without the pressure of other guests watching them. Instead of the wedding day flying by, the first look provides a moment that is just for the two of you. You can share a moment or several minutes to take the whole day in and really, truly be present together on your wedding day. There are a couple of logistics to planning a first look. I’ve listed a few of my favorites below but know that you are not limited to these. Your wedding should be about the two of you and tailoring it to make it special for you! So what exactly is a First Look? Since most people have never planned a wedding before, a first look can be a totally new concept but in the past few years, they have been gaining in popularity. Now it is rare for me to shoot a wedding without a first look! A first look is where the wedding couple has a special moment to see each other for the first time BEFORE walking down the aisle. You both have time to drink it all in and really see your partner. Not only is a special moment for the two of you but it also has other benefits as well. By doing the first look, you are ensuring that you will have romantic portraits together. Weddings are notorious for running behind schedule and romantic formals are one of the most important portraits you will take that day. By doing a first look and a few romantic portraits immediately after, you make sure you don’t miss out on those. 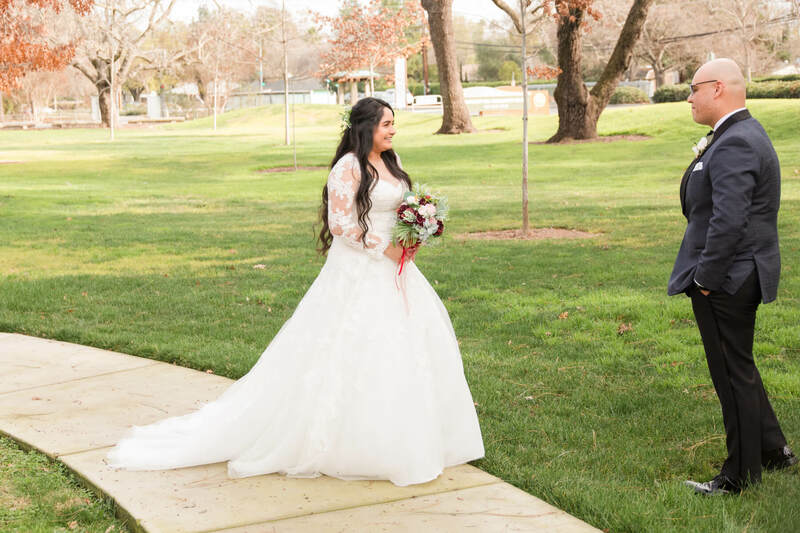 You also have more time to do bridal party portraits if you do them right after the first look and romantic portraits since you are not limited to the time crunch that is the cocktail hour when you’re trying to do romantic portraits, family portraits, and bridal party portraits all in one hour. If you do your portraits earlier, you have time to get a few epic sunset/golden hour portraits during cocktail hour and you can return to cocktail hour and enjoy time with your family and friends. Couples that do first looks usually get a ton more portraits because they have more time for portraits with their photographer. There are a couple of different types of first looks that you can do that we have used and seen over the years but we love hearing about new ones. 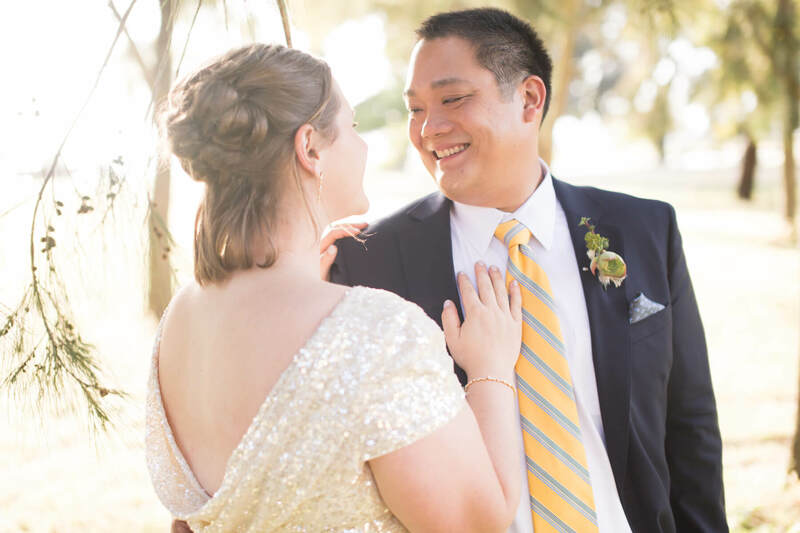 Tailoring your wedding to you and your new spouse is key and making sure that it fits for you and really captures the spirit of what your wedding is all about! 1. Mimic the aisle: This is one of the most popular approaches since it feels very similar to your trip down the aisle. The groom or one of the wedding couple has their back turned. The bride/other partner walks towards them and calls their partner’s name. The groom would then turn around and see their future spouse walking towards them. This leads to some really sweet groom reaction images! Another twist on this one is to touch your partner’s shoulder and have them turn around then. 2. Back to back: Both the bride and the groom/ wedding couple are back to back with their eyes closed. You can do a countdown or turn around when you both are ready. An alternative to this is to wear blindfolds and take them off when you are both ready. 4. The Staircase: This is similar to the aisle as well. The groom/ one partner stands at the foot of the staircase with their back turned while the bride/second partner descends down the stairs and when they are ready, they would say their partner’s name and have them turn to watch the descent. 5. Personalized: You aren’t limited to the options- it’s YOUR wedding after all! Do you have a different idea of what you want to do? Chat with us and we can help you set it up! We had one wedding where the bride and groom were teachers and a few of their students were the jr. bridesmaids. For their first look, the groom’s eyes were covered by the jr bridesmaids and they revealed the bride. First Looks are not limited to the wedding couple. 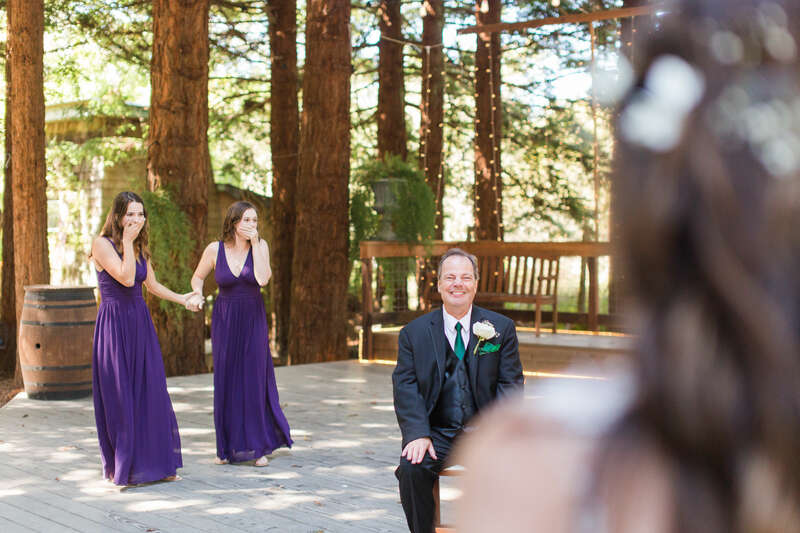 You can also have first looks with your parents, grandparents or bridal party. The important part is to let your wedding photographer know how many different first looks you would like so that they can help you position everyone at the correct angles so they can capture the moment and all the different reactions. One of the most important facets to setting up the first look is to find good light. Good light is essential because if you are in bad lighting that is all you will see when you look at the images. Were you squinting in the bright sunshine or did you have dark circles under your eyes from standing in the wrong type of shade? Before the first look, we find a spot with good, even and natural light. My second shooter positions the groom while I position the bride. Before the first look happens, both my second shooter and I will go over what will happen with the couple separately. 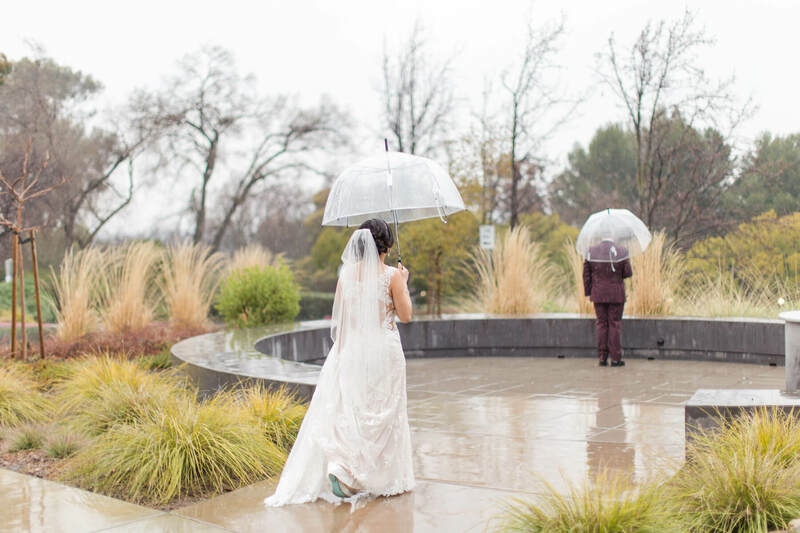 We then will step back far enough to give our couple a moment of privacy while also being able to still capture the joy and emotion of the first look. Once you and your partner are ready and finished having a few minutes to yourselves, we come closer and begin the romantic portraits. One other thing to note is that you can still have a first look AND a special moment while walking down the aisle. If you still want to surprise your partner, you can add something for the walk down the aisle like a veil, special hairpiece, bouquet, etc. Just because your future spouse sees you once does not mean that the walk down the aisle will be any less special. It is usually MORE emotional once you’ve done a first look! Need some more help with wedding planning? Check out these guides for more tips and tricks! 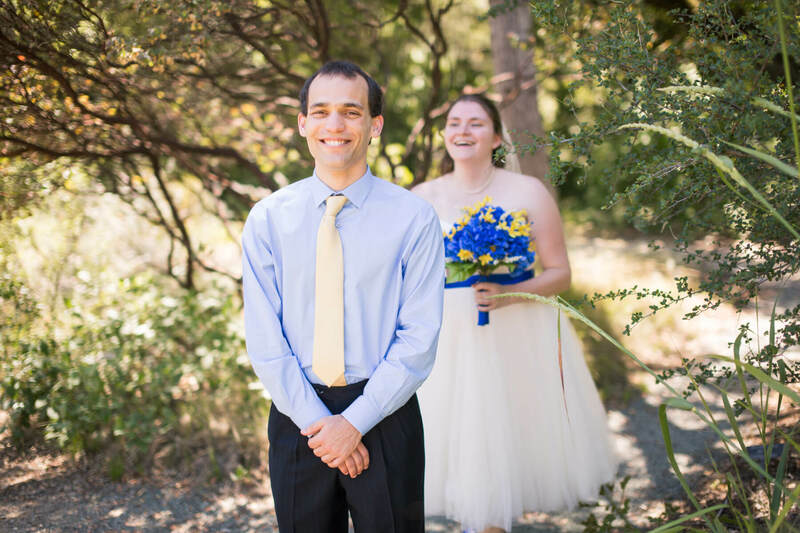 Tips For The Best Reception Ever! Still have more questions? Drop us a line and we can help you plan the best day ever!